Meet Amazon - modern library website design template with built-in features for creating digital library and online book store. It joins the collection of responsive library website templates. This library Joomla template is suitable for creating websites for colleges, schools, education centers and other educational institutions that requires full-featured online library. Amazon Joomla responsive template can be accessed from any type of device and web platform ensuring the best user experience with e-library website. The template has Book Library PRO in the base, library management Joomla extension saturated with a number of features like system of lending books (both from backend area and frontend), options for painless fetching of books from Amazon and for easy management of books and authors. Different formats of eBooks are possible for uploading in Book Library: epub, fb2, mobi, txt, pdf, etc. Due to Book Library it is also very easy to export books to VirtueMart and create online book shop. Also Joomla modules for Book Library are included in the Amazon template package. They allow enhance functionality of Amazon library website and provide essential opportunities: display books in the slideshow, highlight the featured books, authors and more. Powerful features and elements of Joomla Blank template enables to change Fonts (27 font styles), style of links, upload your logo, moreover you can easily insert copyright and Google tracking code via Joomla admin area. 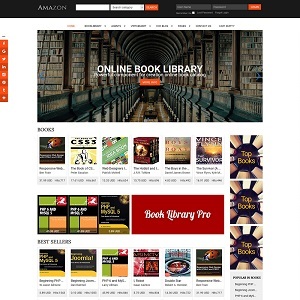 Use Amazon e-library website template to make state-of-the-art website of online library. Plenty of module positionsDue to Joomla Blank template, Amazon comes with a wealth of module positions to place your content exactly where you want it. 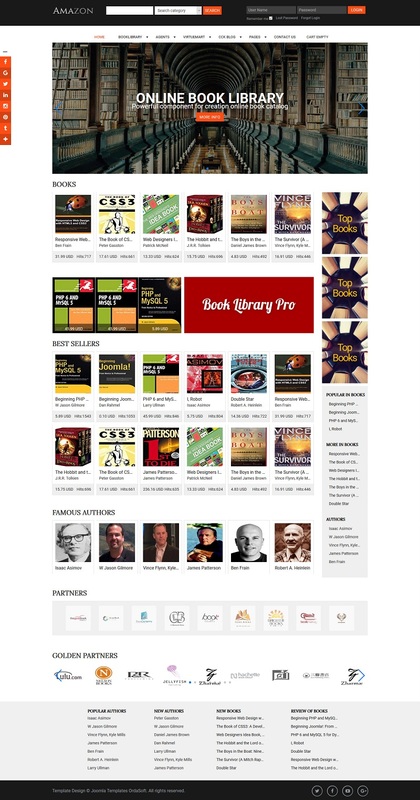 Cross-Browser CompatibilityAmazon Book Library template fully compatible with all browsers: Chrome, Firefox, Safari, Opera and Internet Explorer 9+.